Experimentation is up, longterm use down. Research funded by Public Health England (PHE) came to this conclusion regarding teenage vaping: “Experimentation and use of e-cigarettes have been increasing steadily over time,” but long-term use continues to decline. In fact, over the past five years, PHE reported the number of minors vaping had more than doubled, resulting in one in six individuals aged 11 to 18 vaped at least once, according to telegraph.co.uk. From 2014 to 2018, data suggested adolescent vaping in England jumped 7.8 percent, rising to 15.9 percent. (In the U.S., the rate is 20 percent.) Of the teens and preteens who “experimented” with vaping only 3.6 percent admitted to continuing the act. That figure is a 1.8 percent jump from 2014. John Newton, who serves as PHE health improvement director, sounded confident over the fact regular teen vaping in Britain is trending down after the experimental stage. Sponsored by PHE, King’s College London interviewed 2,000 minors and analyzed data over a five-year timeframe. In 2014, 70 percent of youths who vaped also tried smoking traditional cigarettes. Five years later, only 46 percent smoked both e-cigarettes and combustible cigarettes, telegraph.co.uk reported. 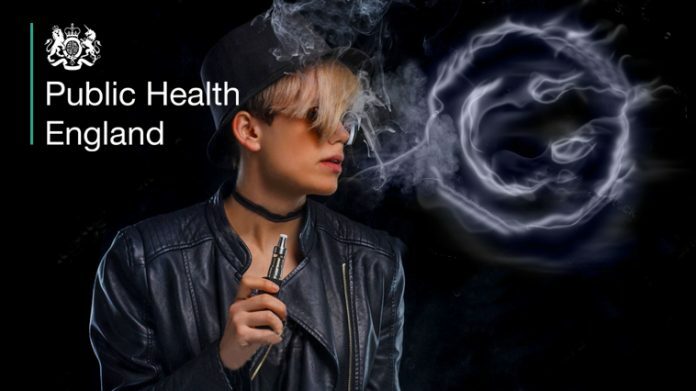 PHE has allied itself with the vaping industry, stating e-cigs are 95 percent safer than cigarettes. PHE officials are on record to saying smokers attempting to quit should try vaping as an aid, advocating for the establishment of a prescription service. Stay informed about the latest vaping research — check out our Vape News page!